The average �Thrifty� family of 4 spends $450 per month on grocery items (food, soaps, detergents etc.) Using Grocery Smarts, a family of 4 can easily get by on hundreds less and consume all the same products and brands. How does it work? Using the stores weekly ad, grocerysmarts maintains a list with the SALE price of each item. In addition, it lines up all the existing manufacturers coupons and tells you what your bottom line is for each item. Most things will be shockingly less than you�re used to paying (Some things even work out to be FREE!) Knowing your bottom line makes it easy to stock up BIG TIME, at the lowest price on things you buy all the time anyway! 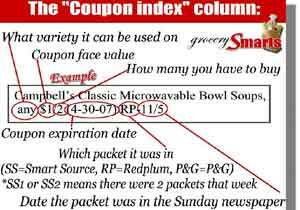 If you already know how to coupon: Using grocerysmarts correctly, you WILL find an extra couple hundred dollars per month you never knew you had. Why wouldn�t everyone use it? The work�s already done for you, and it�s totally FREE! At www.grocerysmarts.com. Select the state you live in. Select the list you want, then print it. (At the top of your screen click �File� then �Print...�). Add the page to your favorites (At the top of your screen click �Favorites� then �Add to favorites��). In the margin, use a pen to mark how many of each item you are going to (See graphic, upper right). 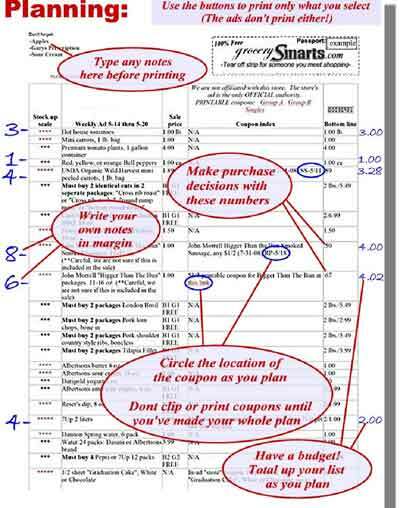 Now, on the same printout, write down everything else you need for the week in the �notes� area (See graphic, upper right). 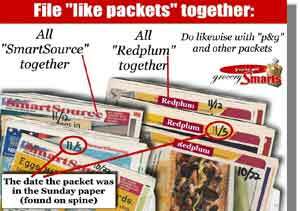 To head out to the store: You leave the packets intact and only cut out coupons for the products you are buying today. Put all the coupons you have cut out, and your printout shopping list (marked-up with your own notes) inside a �Shopping Sleeve�, and head to the store carrying only this sleeve. 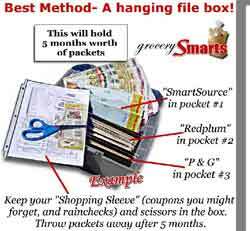 The �stuff you might forget� and other loose coupons should already be in there, so this sleeve is now all you need!